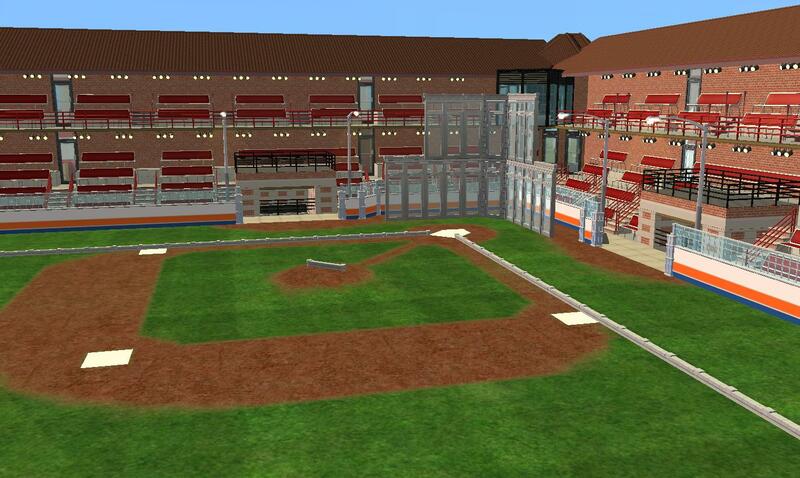 For too long, the Sim State University Fighting Llamas have been without stadiums of their own! With only away games, it became difficult to maintain enthusiasm for the school's athletic program among the student body- and the alumni got tired of only being able to see their alma mater play at other universities! 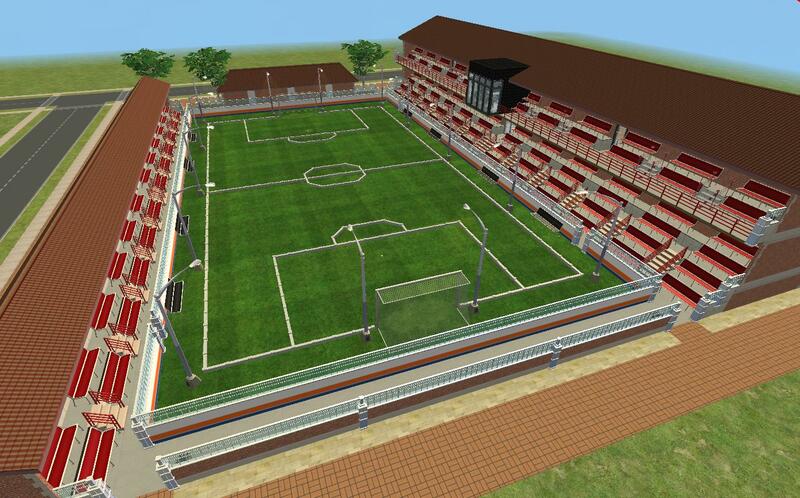 Thankfully, a generous donation to the sports department has allowed the university to construct to new stadiums for their teams to play in. 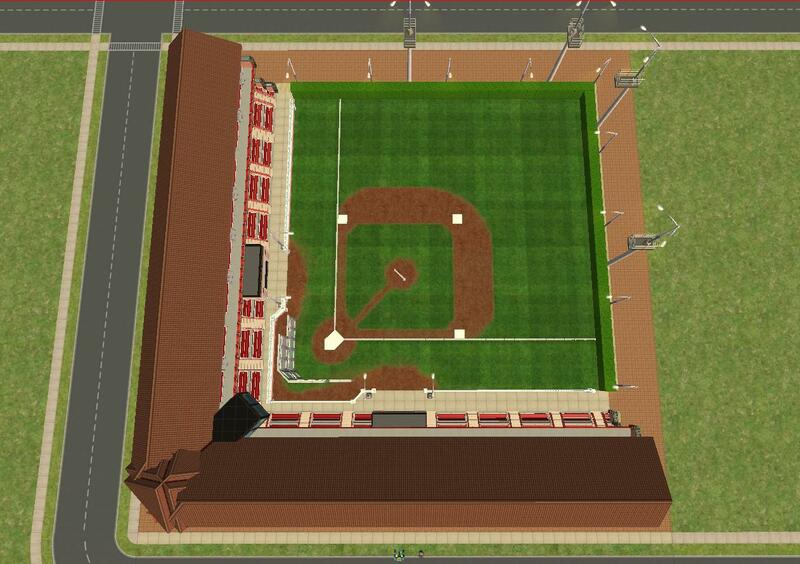 A diamond for the baseball and softball teams, and a pitch for soccer (football) games can soon grace the university's campus. 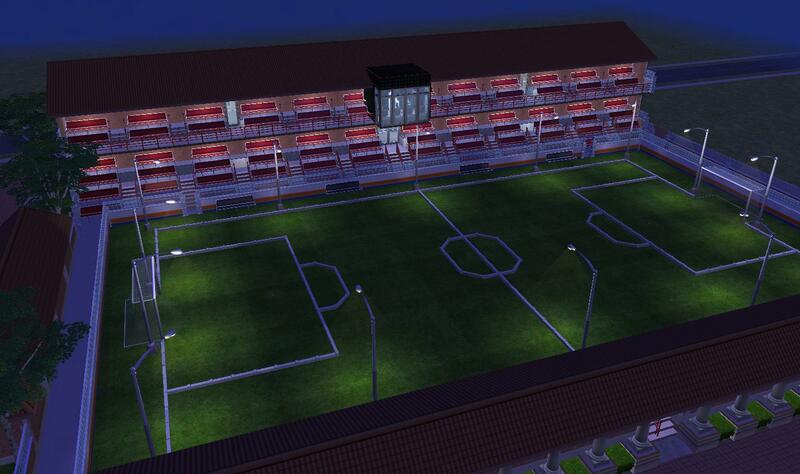 Both stadiums have a huge, brightly lit open space for the playing fields. 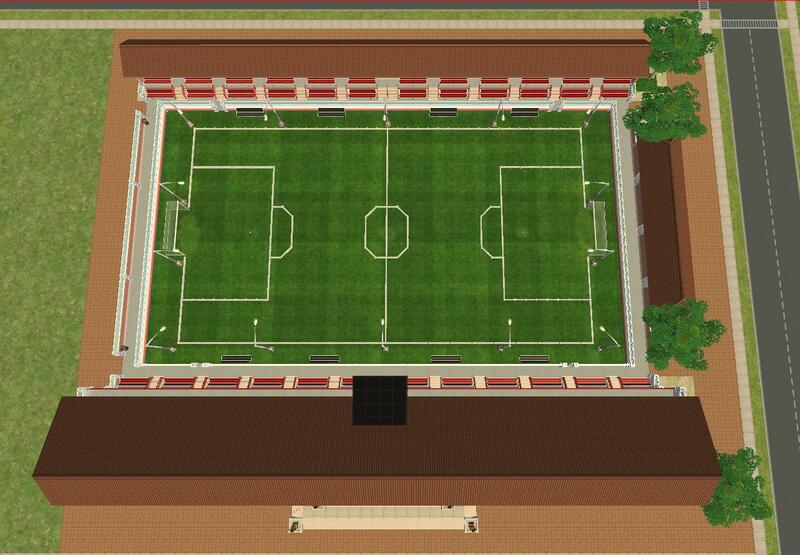 The soccer pitch has goal nets at either end, so your Sims can actually use it if you want. 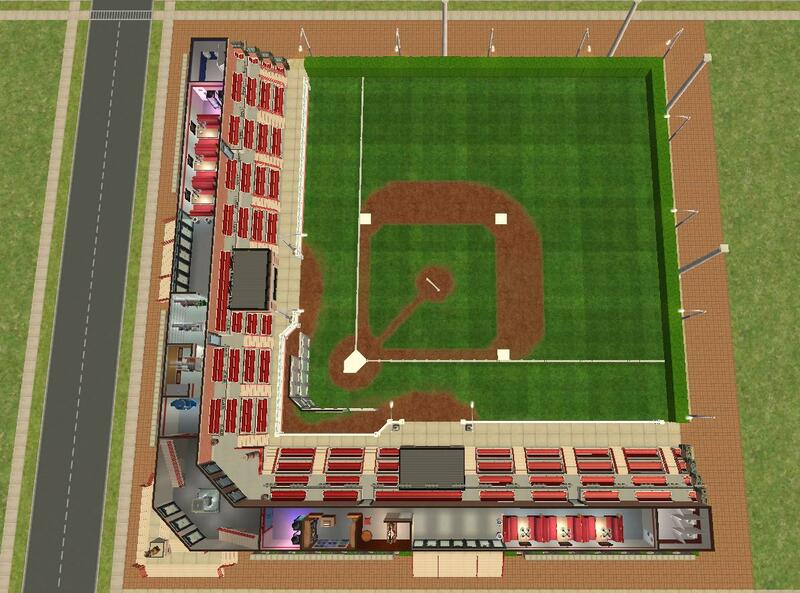 The baseball diamond is essentially just open space with some flooring and garden edging- no real use to it (though it does provide plenty of space for playing catch!) 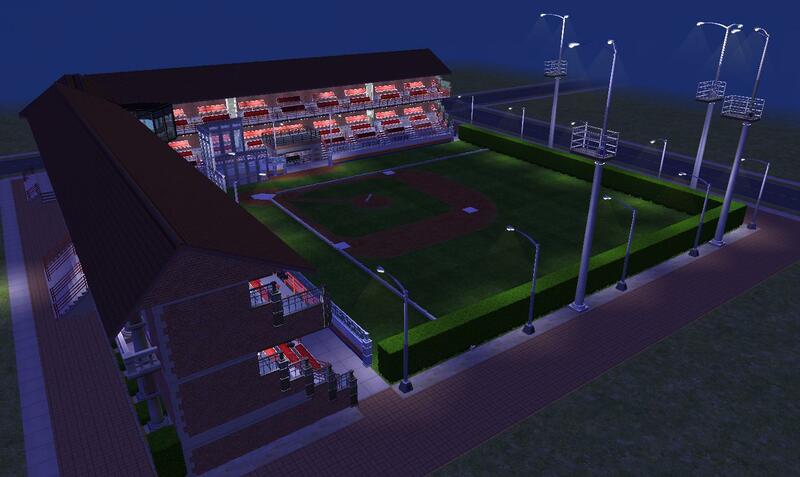 The diamond also has dugouts on either side of home plate, although try though I might, I couldn't find a way to actually make them functional that still looked right. Oh well... 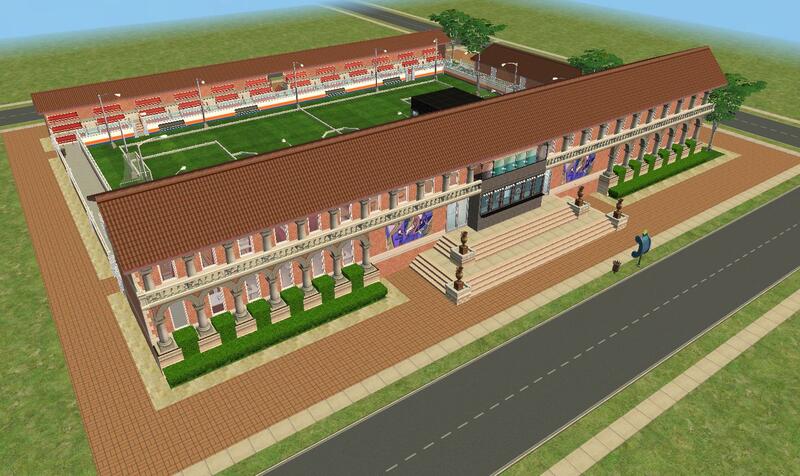 The soccer pitch has two locker rooms in the administrative building behind one of the goals though, and they're both fully functional. Also in the outdoors portions of both stadiums, you'll notice a large black box sticking out from the second level of seating. 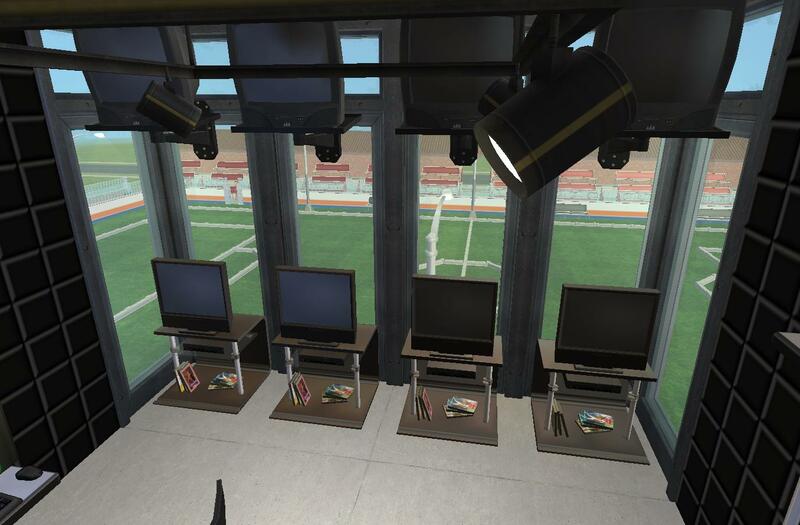 This can either be seen as a press box (there are sports on SimNation's television, so there obviously has to be press there for filming), or an AV control room, for orchestrating the stadium lighting, announcements, electricity, etc. 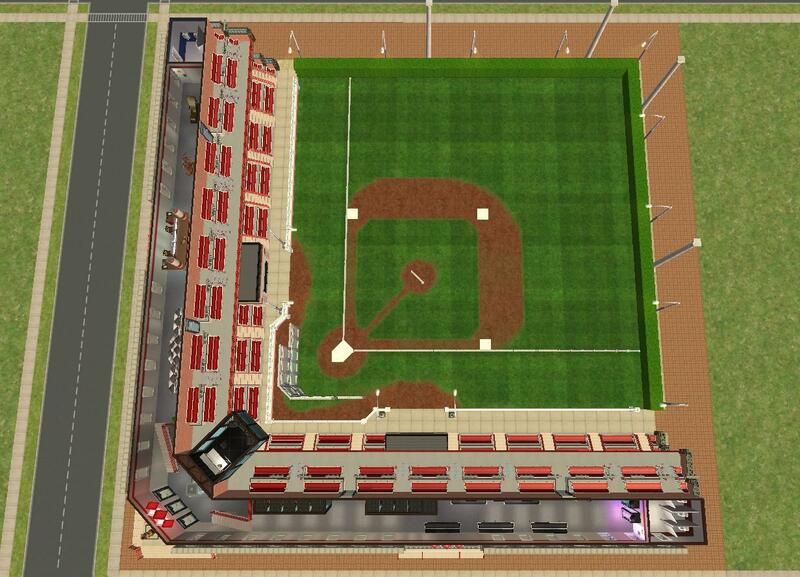 The real usable space on both of these lots is found in the concourses behind the stadium seating. 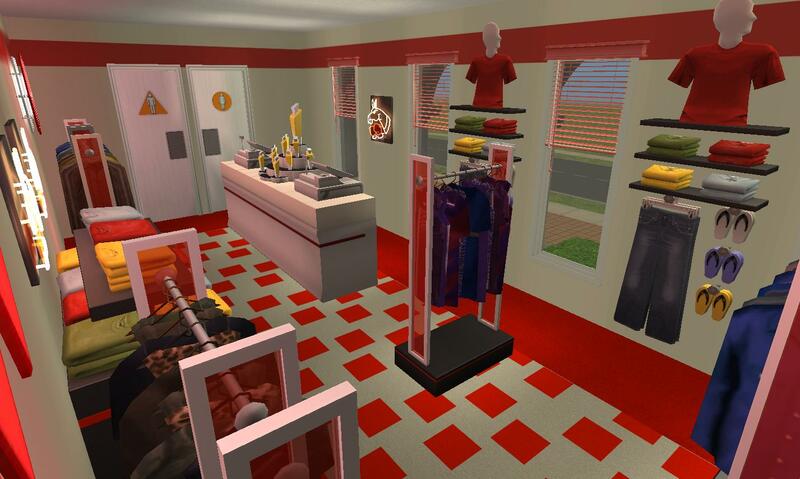 Here, your Sims have a wide array of tiny stores to visit, from coffee shops to newspaper stands to university apparel stores (GO LLAMAS! 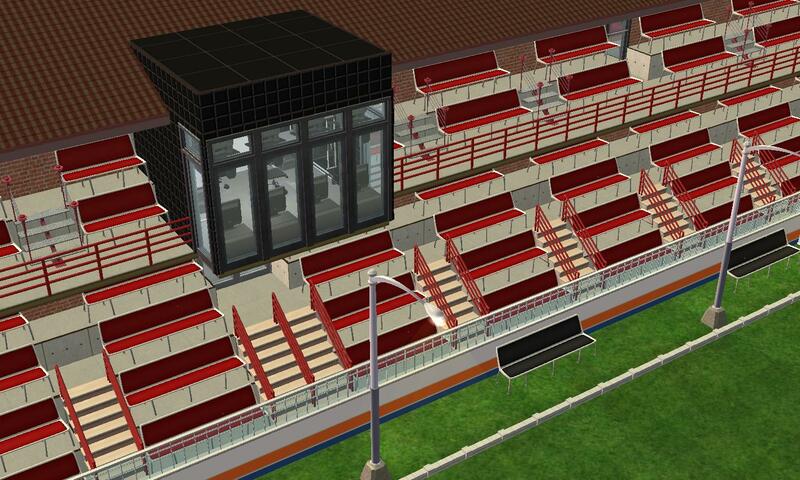 ), as well as plenty of seating away from the noise of the main stadium. There are also plenty of restrooms spread throughout the concourses, so hopefully the dreaded lines for the restroom during breaks in the action can be avoided! 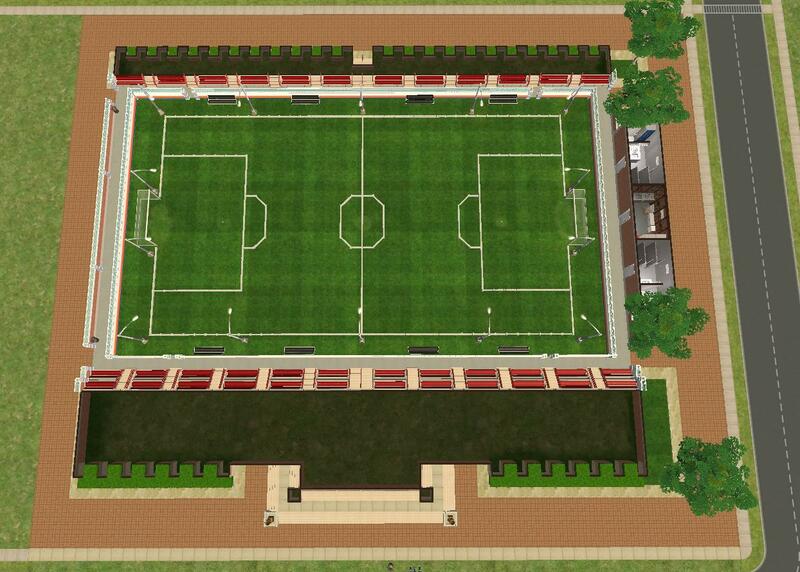 Both stadiums also have small administrative or information desks, really just usable as decoration, as well as good-sized trophy rooms, so that any Sim who attends a game there can see just how awesome the Fighting Llamas really are! Finally, there is plenty of sports-related memorabilia lining the concourses- retired jerseys, helmets worn by game-winning players, and the like. 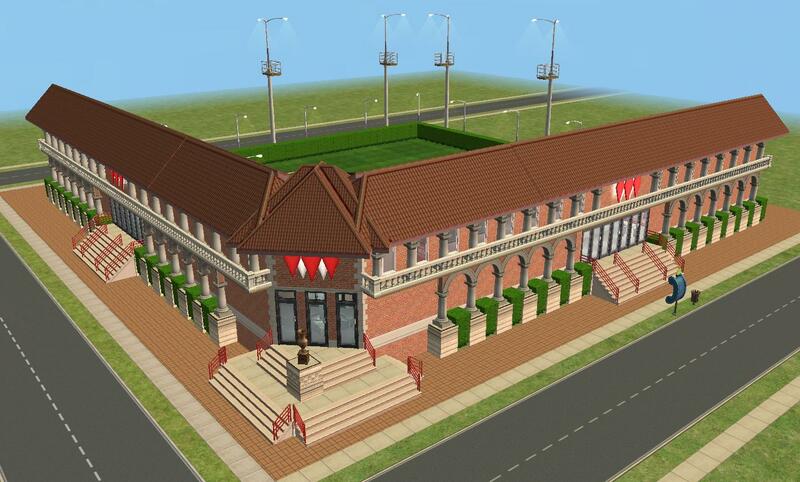 These lots are both designed with the same aesthetic as the university buildings in the Sim State University subhood that shipped with UNI, although it wouldn't be too difficult to tweak them to fit in with another neighborhood (even one that's not a university, I suppose) if you so chose. Personally though, I think one of the biggest failings of UNI is the lack of a school sports program, so it seemed important to have a few stadiums for the university's finest to play in. Since there are two buildings in this upload, the information in the upload search may not necessarily be what you're looking for. 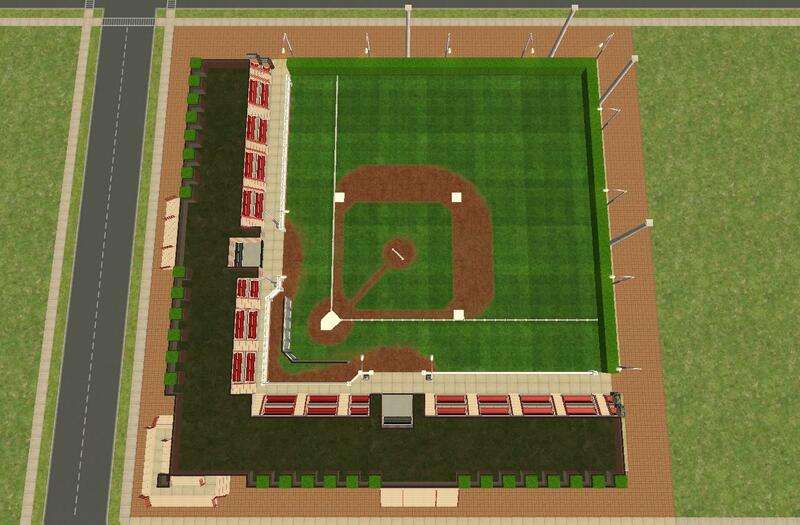 The baseball diamond is a 5x5 lot, ringing in at $320,909. 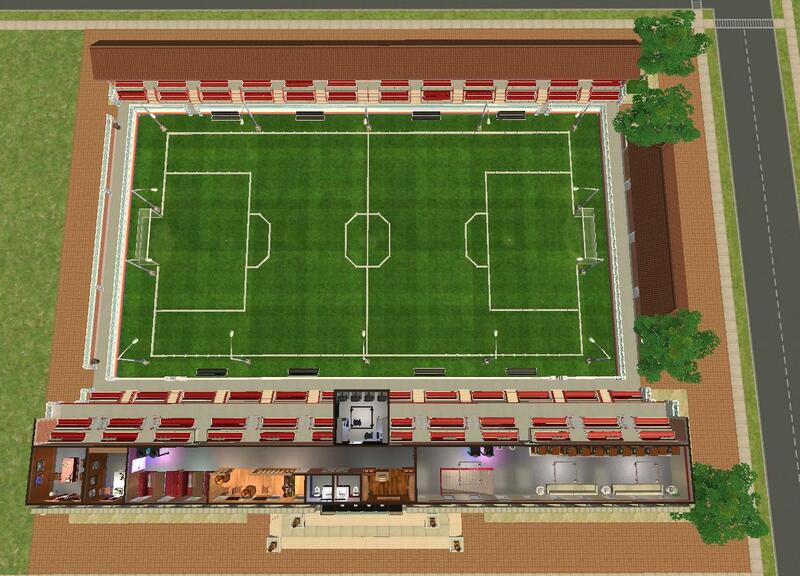 The soccer/football pitch is a 5x6 lot, with a pricetag of $377,688. 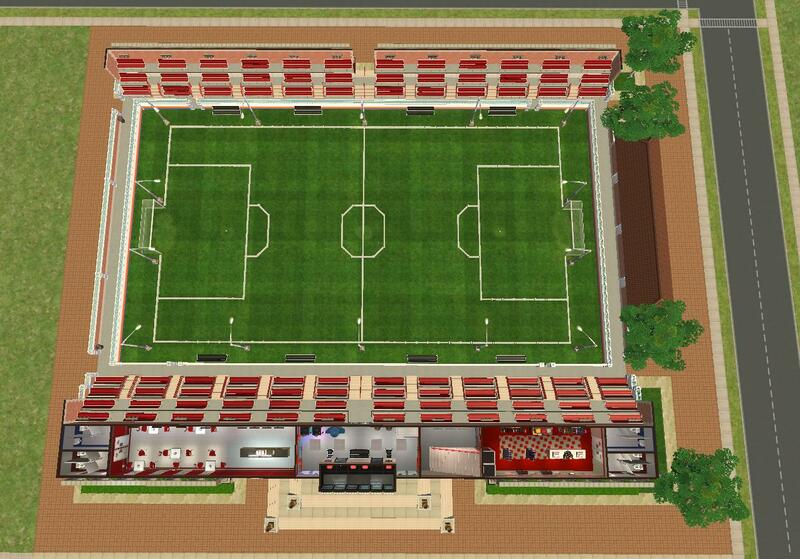 Obviously, both of these are pretty big lots, but as with real-life stadiums, that size is mostly still empty space, so they're not as slow to play as you might expect. Also, if you're just interested in them for neighborhood decoration, there's lots of things within the buildings that can be removed without changing their flavor in neighborhood view. Every EP is required, but once again, there are probably a few SPs that you could get away with not using if you so chose- Happy Holidays and Family Fun spring to mind. That's your decision though- I can't remember what all came with which SP, so I've listed them all as required, just to be on the safe side. I have playtested clones of both of these lots, and didn't find any problems, but as per usual, if you come across any in your gameplay, don't hesitate to let me know, and I'll do my best to fix them. 184 people have said thanks to Zarathustra for this download.